fine art and gallery prints from celebrated image makers show extroadinary depth and detail along with the semi-gloss finish of traditional fiber-based photo paper. When reaching for the highest level of photographic artistry, Museo® Silver Rag™ paper enables you to print and preserve your work in an optimal way. Using Museo® Silver Rag™, fine art and gallery prints from celebrated image makers show extraordinary depth and detail along with the semi-gloss finish of traditional fiber-based photo paper. Two hundred years of American craftsmanship, a first-of-its-kind coating, and 100% cotton furnish enable Museo® Silver Rag™ to meet archival standards while creating a new category of digital printing paper. Optimized for pigmented inks, Museo® Silver Rag™ brings out the best in B&W and color images, and delivers high Dmax and superior tonal range. These performance elements--combined with the finish and hand of fine art paper--meet the long-standing desire of the world's top printers and photographers. Founded on the tradition of innovation, Museo® Silver Rag™ ushered in a historic component to the fine art photographic printing, bringing you as close as possible to fiber-based photo paper. 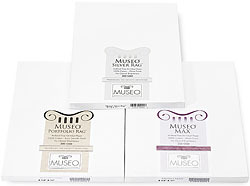 Museo® Silver Rag™ offers unique printing performance that matches the artistry of your most original and distinctive work.